MultiHero Game Review - Download and Play Free Version! A huge ensemble of classic characters with some fast-paced mash-up action! Smash Brothers style fighting with 2D graphics. Adventure mode with 40 levels. Up to four players can play on the same computer. No difficulty settings in Adventure mode. So many classic video game characters, so little time! 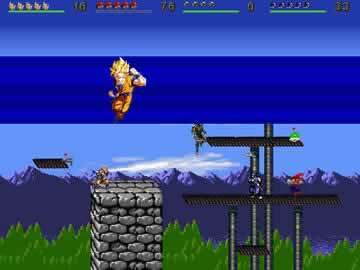 MultiHero is a side-scrolling mash-up in the vein of Super Smash Brothers that includes cameos from some of your favorite characters from video game classics and comics. The cast of characters includes the likes of Super Mario, MegaMan, Ninja Gaiden, Batman, Battletoads, and much much more! The 2D graphics will take you back to the days of the NES/SNES platform, and you're provided plenty of different weapons for your adventure. You can also play MultiHero in adventure mode - a double freeware punch for this fun and expansive game! MultiHero is a combination of a side view fighting game like Mortal Kombat and a multiplayer fighting game like Super Smash Brothers. Playing characters from several different TV shows and comics you will fight your way through levels or battle to stay alive in VS mode. MultiHero is a very challenging game to play, but if you love Mortal Kombat style fighting, you will like this as well. The game has two options for playing: you can either use Adventure mode or VS mode. In all modes you can play with up to four friends on the same computer. You need to have some controllers for your computer because there is only enough room on the keyboard for two players, and even that is crowded. The controls require a total of eight keys that you can set however you want. 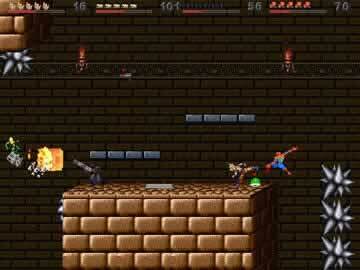 Adventure mode involves obstacles and enemies. There are 40 levels to complete in Adventure mode, including boss fights. Each level will present new challenges to overcome like jumping across large pits or fighting on small platforms over pits of lava. Completing levels in Adventure mode will unlock other characters for you to play. You can play famous characters like Batman, Predator, Goku and even Mario. Each character has their own special abilities like Spider-Man's web attack or Predator's shoulder gun. Once they are unlocked you can go back and play any of the previous levels with your new characters. Unlocking fighters in Adventure mode also makes them available in VS mode. Vs Mode - Just Beat It! VS mode is just fighting with no exploration or obstacles. You can compete against three opponents which can be played by human or computer. There is also the option of setting up teams. In VS mode there are several styles of combat: Capture the Flag, Hold the Flag, Deathmatch and Hit the Target. In Deathmatch you get five lives and the last one standing wins. Hit the Target requires you to throw turtle shells at a target flying around the screen while defending yourself from attack. In every mode except Deathmatch you have unlimited lives. The graphics in MultiHero are comparable to games on the original Nintendo. The low quality graphics really don't detract from the game, instead they give it a retro feel. The sound is mostly borrowed from other games. Levels will feature music from Zelda or Mario. Even some of the sound effects are from other games. Sometimes the sound will make you laugh if you are familiar with the particular theme song. One level has the theme song from Zelda playing. The major drawback to this game is the difficulty. The adventure mode has no way to adjust the difficulty settings and is very difficult. In Vs mode you can adjust the skill level of the computer opponents but it is still very difficult. A large number of players might become frustrated by how difficult this game is. Many levels require a large amount of trial and error to complete and with no checkpoints you will have to start levels from the beginning if you die. MultiHero has great side scrolling fighting and a good multiplayer mode. The difficulty of the game limits the audience that would enjoy it. The controls are easily customizable to however you like them. 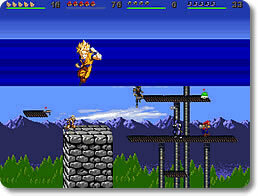 The large number of levels combined with how hard the game is means it will take you some time to complete everything. If you don't mind a challenge or are a fan of Mortal Kombat this would be a good game to download, it's even completely free. Check out the action in this Smash Bros. style fighting game.